Standing tall and poised for battle, her twin white lightsabers ignited at her back and a look of sheer determination in her eyes, StarWars.com is pleased to report that the limited-edition, hand-cast, hand-painted, and hand-numbered collectible is now available for pre-order! 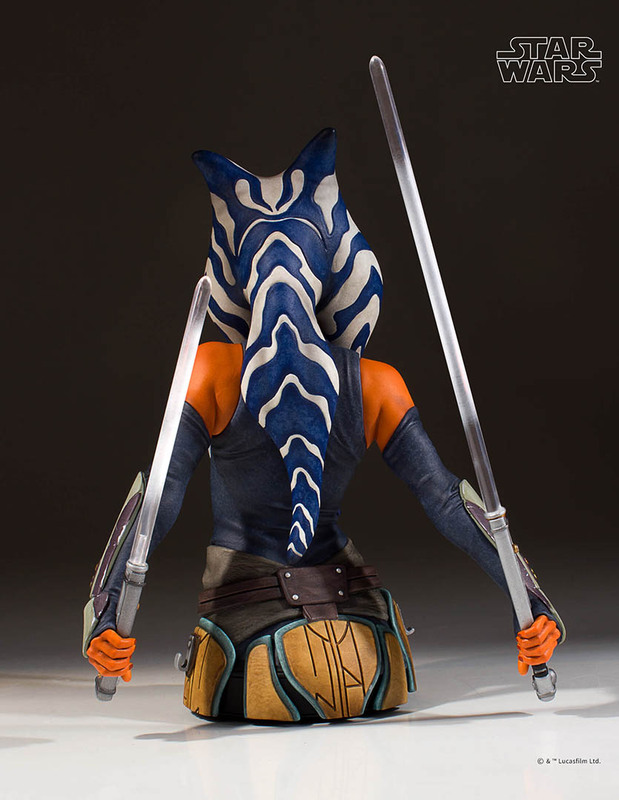 Even turned away from the crowd before being revealed this summer, the stunning likeness captured the attention of none-other-than the character’s creator, Dave Filoni, says Ashly Powell, the collectible manufacturer’s director of product development, a moment that coincidentally came just hours ahead of Filoni’s announcement that Star Wars: The Clone Wars had been saved. This week, we caught up with Powell and Gabriel Garcia, manager of product development for the Gentle Giant design team, to talk about collaborating with the Lucasfilm Product Development team to perfectly capture the character’s likeness and turning Filoni’s animated creation into the stunningly realistic sculpted bust that stands ready to strike. Artists channeled the character’s strength and intensity into the inspiring 1:6 scale mini bust designed, modeled and prototyped in immaculate detail using 3D technology and limited to only 750 pieces. StarWars.com: The bust is really quite gorgeous! 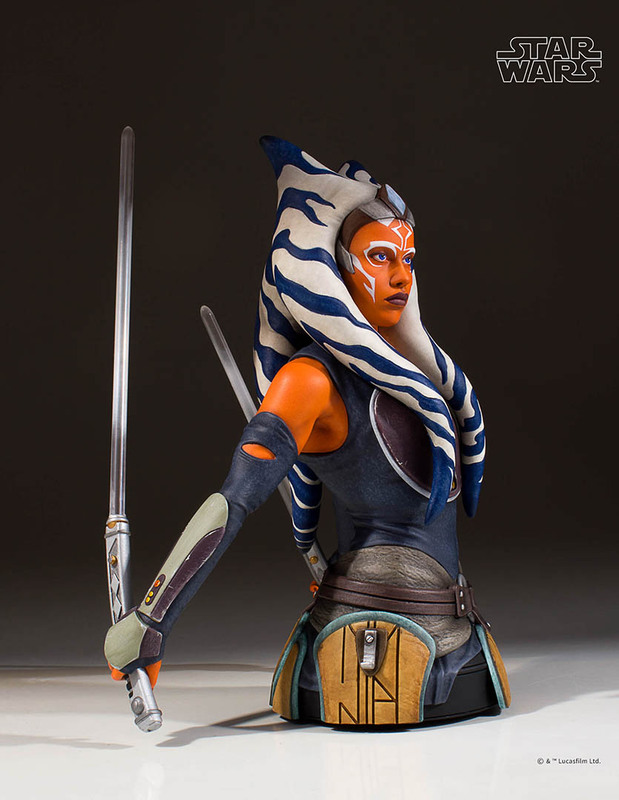 How did you translate the Ahsoka we know from animation into this life-like sculpture? Gabriel Garcia: The whole process starts with an idea. We wanted to do something new and fresh outside the regular saga films. 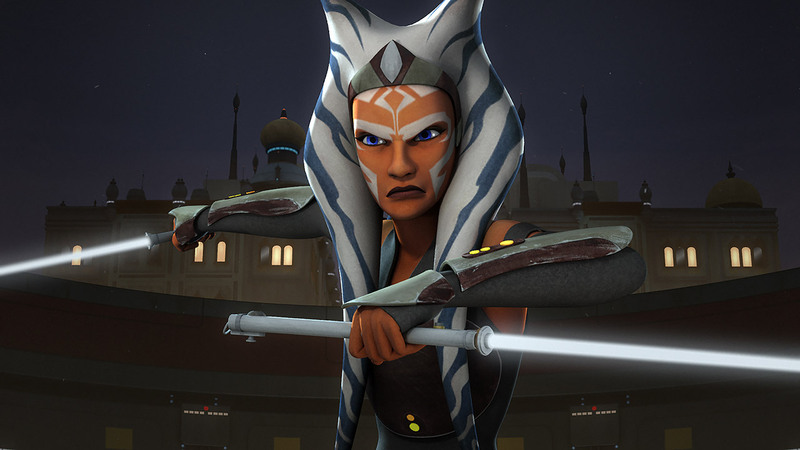 We knew Ahsoka was a fan favorite and we fell even more in love with her after the final season of Star Wars Rebels. 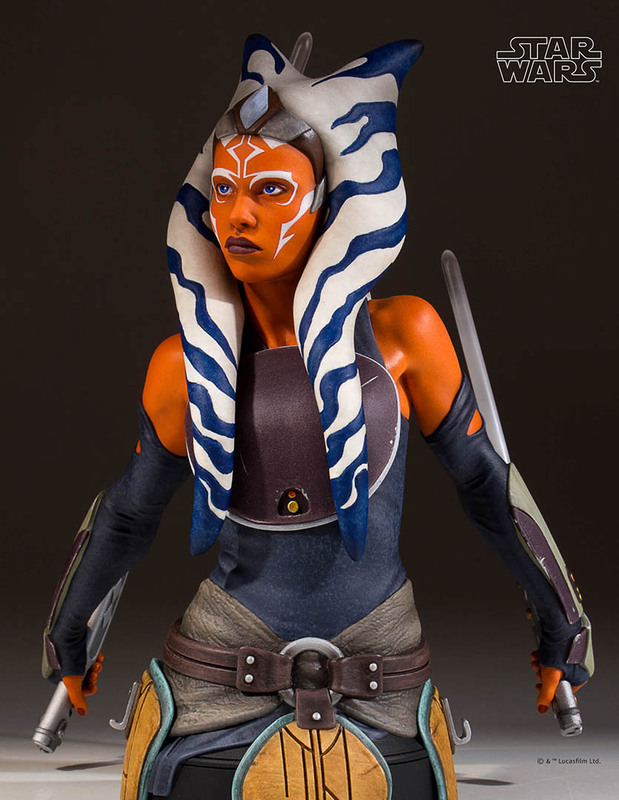 We came up with the concept of doing a mini bust of Ahsoka as if she were a real person, so she would fit in with the rest of our long-running mini bust line. Once we locked the idea, we started working on our 2D concept with our pre-production artists. We looked at a variety of poses for her, but we knew we loved the double lightsabers, and that helped us choose the pose. After the concept was completed and approved by our licensing partners at Lucasfilm, we moved into the sculpting phase. This is where our sculptors had to take all of the great animation photo reference photos of the character and start the real work of translating all of that into a photo-realistic likeness of a person that didn’t really exist. We are fortunate to work with a very talented team of digital artists at Gentle Giant Ltd and they really rose to the occasion. 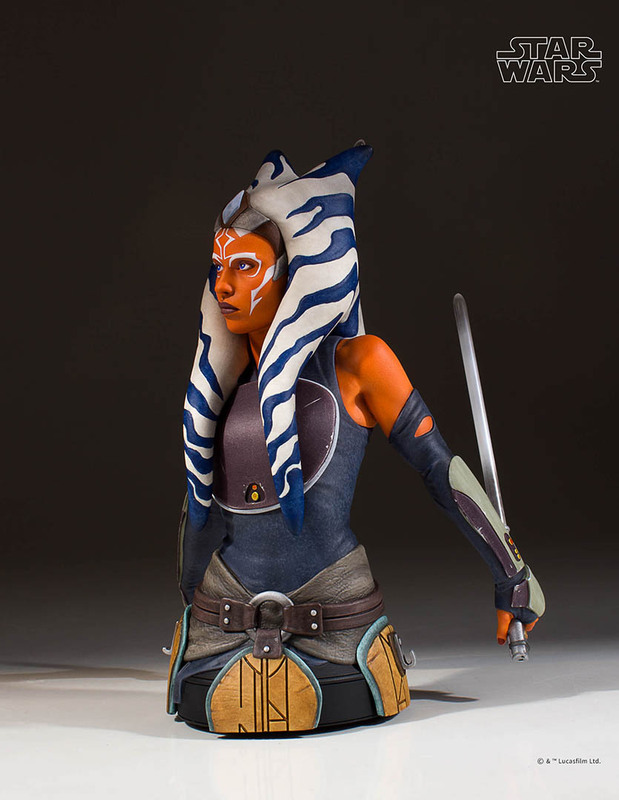 Once the sculpt was approved, we sent the digital model to our top-of-the-line 3D printer to make the prototype and our talented paint department finalized the look of what Ahsoka would look like as a real being with skin tone and costume details. StarWars.com: What was the most challenging aspect of the project? In your mind, what was the key detail or aspect to capture that really makes this piece look and feel like Ahsoka Tano? Gabriel Garcia: One tricky part of this project was the conversion from an animated portrait into a “real person.” Usually for us this process goes the other way around, where we take a real person and make them into a stylized, animated portrait like we did with our animated maquette line of statues. It took watching many episodes, looking at a lot of reference and working many hours to get a look that satisfied us. As far as capturing a key detail for the bust, that can be summed up in one word: attitude. We’ve all been following Ahsoka’s journey for a decade and we have watched her grow from a young Padawan into a leader in the Rebellion. There is a determination in her eyes and a strength inherent in her body language that we had to nail if we wanted to be able to call this Ahoska. It took us a few passes to get it right because there is no road map to sculpting strength or courage, but I think we nailed it in the end. StarWars.com: I heard Dave Filoni actually stopped by the booth at SDCC to hold the prototype and he was quite enthralled. What was it like getting the stamp of approval from Ahsoka’s creator? Ashly Powell: Usually before the convention starts, we will unpack our prototypes and turn them facing away from spectators, so that our “big reveals” aren’t spoiled by folks walking around the show floor and snapping photos on their phone and then posting on social media before the show opens. So, here I am standing inside our booth unpacking some prototypes that were going into one of our Star Wars display windows and out of the corner of my eye, I see someone on the other side of our display window, and he is really staring at the back of our Ahsoka mini bust. When I realized it was Dave Filoni — He wasn’t wearing his signature hat! — I motioned to him and then slowly turned her around so that he could see the entire piece from the front. His eyes grew bright and I carefully grabbed our Ahsoka Mini Bust, and carried her out to do a formal “meet and greet.” I was really proud and excited to share with him. Honestly, a bit nervous too. 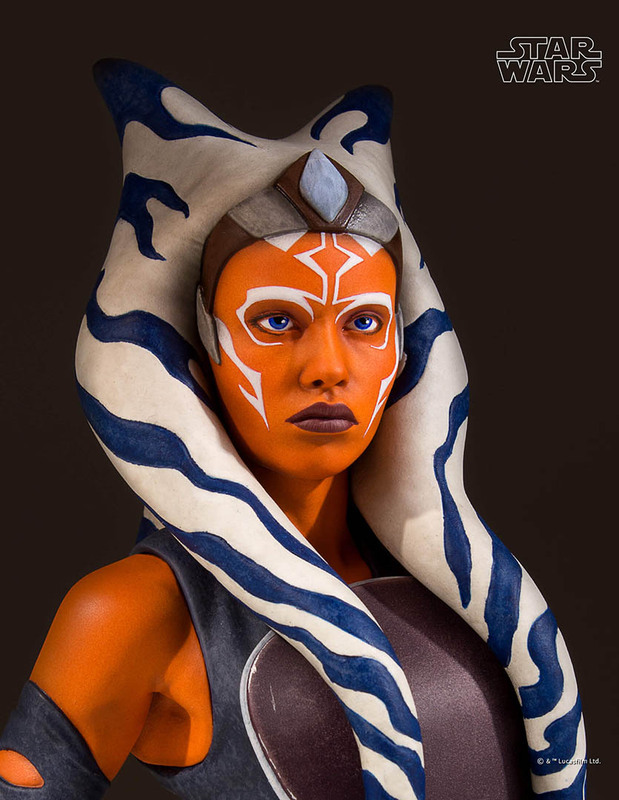 I mean, this was a realistic interpretation of the beloved animated Ahsoka. I knew that we thought she came out beautifully, but would Dave Filoni approve? I handed the bust over to Dave. He marveled at her and admired every detail we captured and he said that is was the best realistic interpretation of Ahsoka he had ever seen. My heart raced, and a smile grew from ear to ear on my face. We had gotten the Filoni stamp of approval! Dave thanked me again and again for sharing her with him and as he walked away, it reminded me that these little moments make my job so extraordinary and humbling all at once. 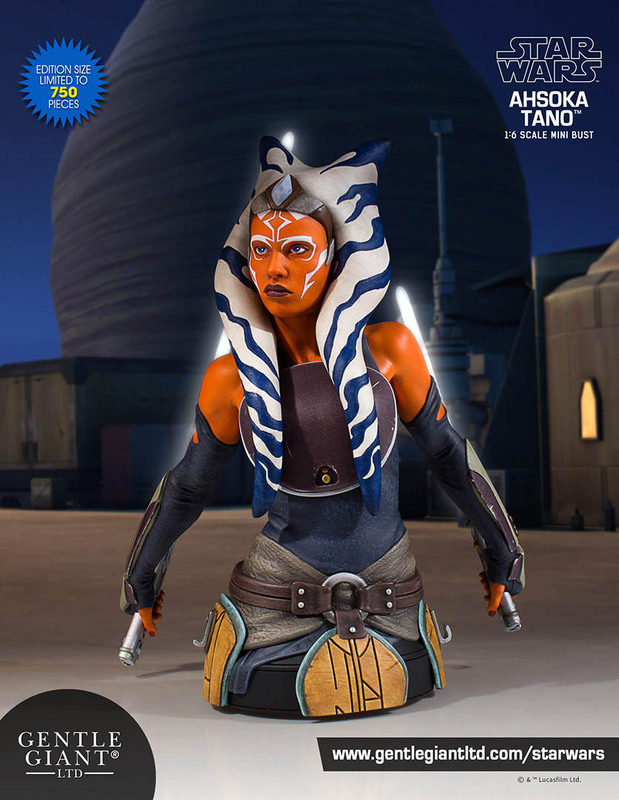 You can pre-order your own Gentle Giant Ahsoka Tano mini bust now!